The Third Root is a visual experience like no other, as it unveils the unseen community of the Costa Chica area of Oaxaca and southern Guerrero, Mexico. Look into the eyes of those who have been suppressed from Mexico’s mainstream culture, as the photographs tell their story. 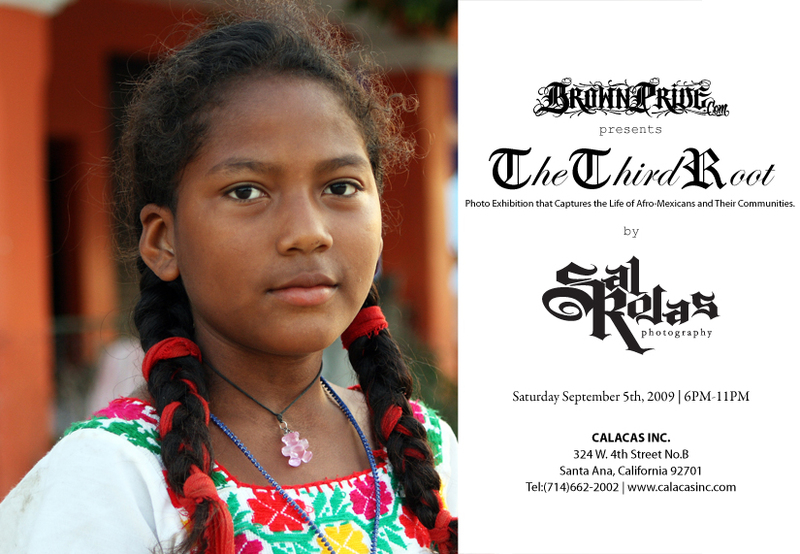 This photographic exhibition hits Calacas located in the heart of Santa Ana, California September 5, 2009. Photographer Sal Rojas says “This exhibition is going to give you a comprehensive view of our complex Mexican culture, adding another degree to our rich Heritage, the Afro-Mexican legacy.” Most people think of Mexicans as a Mestizo race, a mixture born from the violent clash between the Spanish and the Indigenous. Mexico’s history ignores the nation’s “Third Root”, Africans and their descendants, to this day receive little if any attention. In the Mexican states of Oaxaca and Guerrero this “Third Root” is strong and represents the other side of Mexico that many are unaware exists. The Third Root Photo Exhibition is a preview of the documentary television series “Afro-Latinos – The Story Never Told” produced independently by Director/Producer Renzo Devia of Creador Pictures, LLC. The documentary series will illustrate the history and celebrate the rich Culture of people of African descent throughout Latin America. Catching the authenticity of life is nothing new to Renzo Devia and Sal Rojas. They both have traveled the world to tell the untold stories of Latino people and their Culture through their respected mediums. With this photography exhibit and film project they are bringing attention to Mexico’s “Third Root,” the Afro-Mexican legacy. Krazy Race is one of the most respected underground hip-hop groups for representing Latinos from the Heart. Join us for a special “Brown Pride” set with some of their most potent street anthems. For additional information on The Third Root, please contact Sal Rojas or visit www.BrownPride.com. Sirs, from my point of view, this body of works is shedding light on who we really are, andhow we got to where we now are. Artifacts seem to indicate a African presence in South America many centuries age, prior to slavery. Many people are unaware of the important contributions made by Afro-Mexicans, and is another reason this third root has remained unknown and uncelebrated. Thanks for your contribution. Great. Continue your Negrification agenda in Mexico.